Dogs love toys, and the thing they love most about toys is destroying them. At least, that’s the case with so-called aggressive chewers, who have a knack for shredding whatever plaything you put in front of them – be it plush, plastic, or rope. If your dog fits this description, you probably have a heap of eviscerated and mangled toys somewhere in your home. Pitbulls, Labs, and other powerful breeds are known for being strong chewers, but even tiny dogs can wreck toys in no time if they put their minds to it. The worst thing about it – aside from the possibility of your dog swallowing indigestible pieces – is the money you waste on toys that only keep your dog entertained for a few hours (or even a few minutes). While no dog toy is completely chew proof, some are much more durable than others. Here are 10 of the best indestructible dog toys on the market. If your dog can chew through these, she probably deserves some sort of prize. 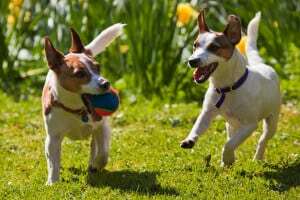 Squeakers are always the first to go – and for many dogs, once the squeak is gone, so is their interest. The solution? Multiple squeakers, of course. This plush mat has several squeakers sewn inside, giving your ruthless toy offing pooch more than one target to work on. As a bonus, this toy doesn’t have any stuffing to be swallowed or strewn around your house when your dog eventually tears it open (and your dog will eventually tear it open – it’s plush, after all). Got a chewer and a swimmer? Then you could hardly do better than this toy, which floats on water and is guaranteed strong. If your dog destroys one of these, the manufacturer will replace it free of charge. The toy comes in three neon colors, which make it easier to spot in the grass. Dental bones are great for cleaning your dog’s teeth, but most of them can’t withstand the fury of an extreme chewer for very long. This toy is designed specifically for heavy chewers, so it stands a much better chance of holding up. That said, really tenacious pups might be able to chew off little pieces of this, so it’s best to check the toy’s condition periodically. If your dog’s not a big fan of T-Rex’s, there are also Brontosaurus and Stegosaurus versions. It may be jolly, but it’s also rather badass. This tough toy can keep dogs engaged in multiple ways, and in many settings. They can play tug-o-war with the rope, chew on the ball, play fetch, and so on. Oh, and by the way, the ball floats and can be punctured without deflating. That makes this another great option for water-loving dogs. Dogs love their balls (please, no neutering jokes). However, standard tennis balls aren’t designed to withstand the vice-like jaws of a super chewer. While not truly unbreakable, this is possibly the toughest dog ball on the market. As you can likely tell from the Diamond Plate name, it’s built specifically for durability. The toy’s manufacturer, Planet Dog, also offers a tough football, soccer ball, and an assortment of really creative toys. Yes, there’s something for serious bone-chewers as well. Just looking at it, you can tell this is one wishbone no one will be snapping anytime soon. Three different prongs give the dog an interesting shape to work with, and raised bristles help clean her teeth while she gets busy. Frisbees are no match for an 80 pound dog with jaws of steel. This flying disc offers a more durable alternative. It won’t last forever – especially if your dog becomes obsessed with chewing it – but it will definitely outlast a thin piece of plastic. An equally important selling point is that the flyer is made of soft rubber. For dogs who like to catch frisbees, it’s much easier on the mouth. This may not be the strongest dog toy in the world, but if you really want to get your aggressive chewer a cute plush toy, here’s one that stands a chance. It’s double seamed and made of a tough kevlar-like material. That’s probably not enough to stop a dog who’s intent on getting at that sweet, sweet stuffing inside, but it’s certainly stronger than your average plushie. These toys come in a lot of different forms, everything from dinosaurs to barnyard animals. Stuffing treats or other food in a toy is one way to keep a dog engaged for hours. That is, unless they bite right through the toy in minutes. The Tux from West Paw Design is made with a highly durable material known as Zogoflex. Like the Zogoflex Hurley, it’s guaranteed in case your dog manages to chomp through. This toy isn’t just for quiet chewing time. It also bounces and floats, making it a good choice for active dogs. This is perhaps the toughest dog toy in existence. Judging by the customer reviews, it’s won over a lot of people who have tried a lot of other products and never thought they’d be able to find a toy their dog couldn’t annihilate. You know it’s gotta be tough when comes with a lifetime guarantee. For safety, this toy is constructed with a red interior, so you know when the dog has penetrated the surface. As the maker of this toy advertises, as long as the green is showing, you can let your dog gouhnuts. Have a destructive dog in your life? Tell us about it in the comments section!